Mave Alft, creative design behind Alft Decorators is one of my favorite designers specializing in home interior walls and ceilings. Her work is just gorgeous! From raised designs to foils and plaster work, she never seems to run out of awesome ideas! 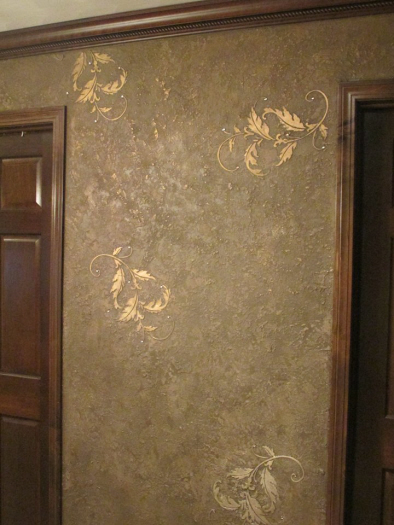 I absolutely fell in love with her use of our Raised Plaster Acanthus Flourish Stencil on faux finished brown walls then embellished with metallic gold. Simple and elegant yet it really catches your eye and brings elegance to those lovely walls. On her site, you will see extensive use of our Raised Plaster Aspen Tree Stencil as well. You’ll get some great ideas from this wonderful gal!